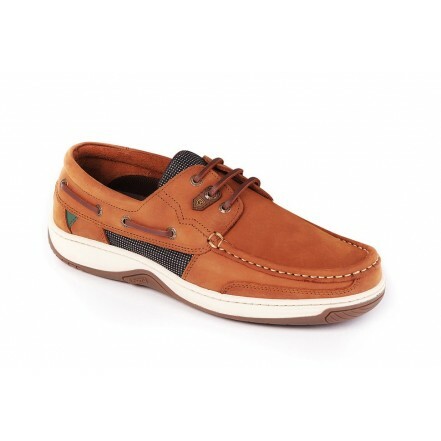 Water resistant men&apos;s leather deck shoes, the Regatta are crafted from DryFast-DrySoft nubuck, leather and fabric and come in a range of colours. Team with Dubarry men&apos;s shorts and a polo shirt for a sporty, nautical look, or wear with men&apos;s jeans and shirt for a smart, casual feel. • Made from a combination of water resistant DryFast-DrySoft nubuck, leather and fabric. • New Dubarry bi-colour cup sole provides superior traction, lateral stability, exibility and durability. • Modern construction improves exibility and reduces overall weight by 15%. • Dubarry&apos;s distinctive port and starboard coloured ash detail. • Branded eyelets and TPU facing detail, incorporating logo.